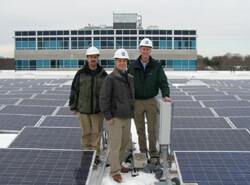 (Left to right) Cummings electrical team leader Ken Orso, sustainability manager Gary Gresh, and associate construction division manager Scott Ronan directed the solar panel installation project. Cummings Properties recently completed the third phase of a major 250 kW Photovoltaic solar panel installation at TradeCenter 128. 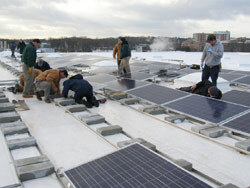 Cummings employees assembled the entire array, which consists of 1,256 solar panels, and is located on a support structure over the top floor of the building's five story parking garage. In the accompanying pictures, the adjacent building is the top of the Middlesex County Superior Court. Partially funded by a grant by the Massachusetts Renewable Energy Trust, the solar array generates much of the power for common area lighting and HVAC systems at 300 TradeCenter. It is among the largest solar installations in Massachusetts. The system consists of 1,256 Canadian Solar panels, three 95kW Solectria inverters, and both Panel Claw and Unirac racking systems. 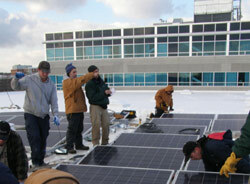 The system was designed and supplied by Munro Solar of Fall River, Massachusetts. The first phase of the solar installation began producing power January 24, 2009. The second phase went on-line December 16, 2009. The system is expected to produce over 400,000 KWH of very green power per year. Client firms at TradeCenter 128 enjoy the benefits of energy-saving features in a convenient and comfortable location. LEED Gold shell and core pre-certified, convenient on-site recycling programs and green housekeeping. TradeCenter 128 is a seven-story, 400,000-square-foot Class-A office building fronting Route 128/I-95 in Woburn, MA, and adjacent to Middlesex County Superior Court. It's parking garage accomodates more than 1,000 cars. TradeCenter 128 received LEED Gold pre-certification from the United States Green Building Council (USGBC) and was developed by Woburn-based Cummings Properties, LLC. The United States Green Building Council is a non-profit organization focused on energy efficient sustainable design that has developed the LEED building rating system (Leadership in Energy and Environmental Design). LEED is a nationally recognized rating system that establishes a whole building design approach, recognizing performance in five key areas: site development, water savings, energy efficiency, materials selection, and indoor environmental quality (www.usgbc.org). TradeCenter 128 includes dozens of important features often associated with a green building, including premium efficiency HVAC and lighting systems, high-performance glass, water-saving fixtures, shaded parking, operable windows, rainwater storage, high recycled content materials, construction waste recycling and building recycling programs. The building also features a major 250 kW photovoltaic solar array that powers much of the common area electrical load for 300 TradeCenter. TradeCenter 128's other community-beneficial features are a site design that reduced environmental impact, on-site public transportation (MBTA bus), preferred parking for low emission vehicles, property location in an area with established services, and on-site recycling programs. Building occupants benefit from lower utility costs, improved air quality and lighting, and green housekeeping. Cummings Properties has a long history of energy-saving construction and utilization of recycled materials, including several "Energy Star" buildings and recycling programs in most of its many properties. Cummings has also established the position of Sustainability Manager to coordinate its energy saving and recycling efforts. Cummings Properties is a full-service real estate development, property management and construction firm with more than 70 major buildings and 9 million square feet in 10 North Shore communities. Its facilities are home to nearly 2,000 office, laboratory, R&D, retail and general commercial clients. Because of its many energy-saving features, TradeCenter 128 is the cost-saving alternative to Waltham office space on Route 128/ I-95. For more information on this project, please contact design manager James Trudeau, 781-932-7028. Cummings Properties is home to a growing community of clean energy companies including Agrivida, Bioenergy International, ElectroChem, GEO2 Technologies, Wokanda Technologies, Green Network Exchange, and Mascoma. These and many other growing technology firms enjoy the benefits of leasing at Cummings Properties such as the expansion space guarantee, the value of low-cost, full-service lease rates, and being part of a business community of high-tech companies which occupy more than 2 million square feet of space.